William’s sister, Elizabeth Nelson (1837-1916), was married to Pleasant Clark in January 1851. 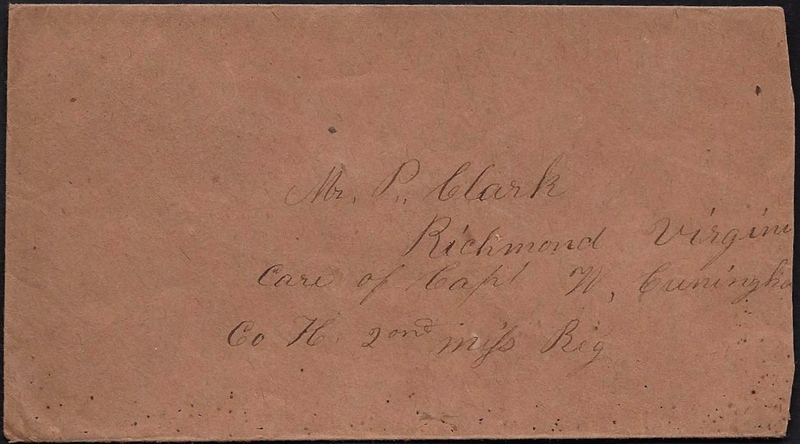 William wrote this letter to his brother-in-law, Corporal Pleasant Clark, “who was born in Alabama in 1828 and became a farmer and community healer in Chesterville, Mississippi. He entered the service with Co. H (“Coonwah Rifles”), 2nd Mississippi Infantry. He was hospitalized in 1862 for 25 days at the Confederate General Hospital at Charlottesville, Virginia, with pneumonia. He was killed in action in the Battle of the Wilderness, May 6, 1864. “He served in General Robert E. Lee’s Army of Northern Virginia, General A.P. Hill’s Corps, General Henry Heth’s Division, General Joe Davis’ Brigade. He saw action at 1st Manassas, Seven Pines, Gaines Farm, Malvern Hill, 2nd Manassas, South Mountain, Sharpsburg, Gettysburg, Falling Water, Bristoe Station and the Wilderness. “At Gettysburg, he charged next to General George Pickett’s Division with General Heth’s force, then under the command of General James J. Pettigrew due to Heth’s head wound. Research indicates that, due to his unit’s deployment, he and his comrades probably saw General Lee many times as he rode up and down the Orange Plank and Brock Roads area in the Wilderness. “Cpl. Clark’s remains have never been found and it is surmised that he is buried in an unmarked individual or mass grave or his body was consumed by the fire that swept much of the Wilderness battlefield. 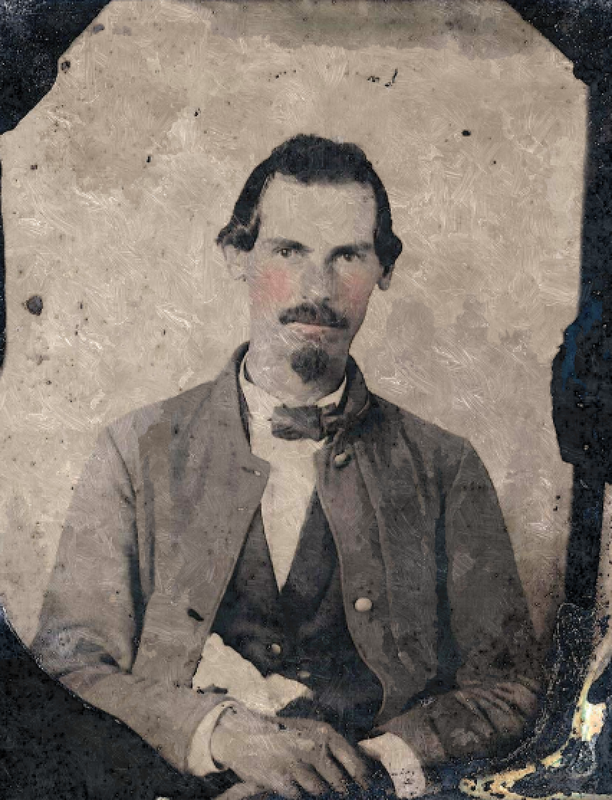 Research into the location of his remains has been and is continuing to be conducted around Orange, Culpepper, Fredericksburg and Spotsylvania. I avail myself of this opportunity of writing you a few lines to inform you that I am in the land of the living and not very well but better than I was the other day. I had three very hard chills and fever with this exception. I have enjoyed tolerable good health since I have been out which is 4 months and have not been in a fight yet but we are expecting a fight every minute. We sleep on our arms every night and we sent out some scouts and it it is though they are fighting now. I hope this may find you well and doing as well as a soldier can. I heard from home the other day on the 15th of this inst. and they were all well then. Our army is moving north and I hope we will be able to reoccupy Tennessee again before long. Times is hard and dull and I get but little news here in camp. Therefore, I [have] not much to write to you. I want you to excuse my not writing sooner for I have been harassed till I could not write. Write to me as soon as you receive this and direct your letters to me at Guntown, Itawamba County, Mississippi in the care of Capt. J. T. Pitts, Co. G, 4th Mississippi Cavalry. I am a descendant of these men. Could you tell me why it is noted that William Nelson “May”have looked like this? I am so thrilled to have a copy of anything from my family! Because I don’t have a picture of the writer of this letter so I simply put in a picture of someone whom I think they might look like to enhance the graphics of the blog page. If you have a photograph, please let me know and I would be happy to substitute image. Thanks! I just wish we did have a picture. This note is really wonderful.